For a limited time, those purchasing the Microsoft Surface Pro 3 from the Microsoft Store, will be entitled to a $100 promotional credit and a free Snugg sleeve. The latter is a polyurethane synthetic leather sleeve that normally retails for $29.99, and is available in purple, magenta and red. The free sleeve is available through January 4th, 2015. The $100 promotional credit is available until December 20th. Those buying the Surface Pro 3 from the Microsoft Store can use the credit to reduce the price of the Type Cover accessory from $129 to $29. Or, the $100 credit can be applied toward the purchase of other accessories and content. Once you purchase the tablet, a promo code for the $100 will be sent to you. Microsoft has been pushing the Surface Pro 3 hard, and earlier this year the table was said to be selling faster than any previous version of the Surface Pro. Not that there haven't been some hiccups. Last month, Microsoft sent some Surface Pro 3 tablets to CNN as part of a partnership between the cable network and Microsoft. Instead of employing the slates on live television as a source for breaking stories, CNN reporters used them as a stand to prop up their Apple iPads. 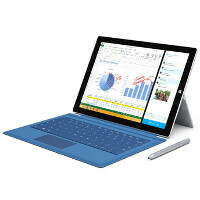 Buy a Surface Pro 3 from the Microsoft Store and receive a $100 promo credit along with a free sleeve"
Amazon is offering a 100$ gift card too but no free sleeve. Nice! This is the best tablet on market today. I agree that it is a very nice tablet/computer. I've read a lot of reviews and they all mostly indicate that the SP3 is a better laptop than it is a tablet and it does neither of both function extremely well. Anybody that could testify or debunk this? I use mine all the time in different modes. In the university as a laptop for writing and drawing in SolidWorks and at home as a tablet for browsing, playing mobile games (installed bluestacks on it), youtube watching and connect it to my tv for football streaming. You must use one on daily basis to really understand how good this product is. I love mine and would not change it for any laptop on the market. I got the i7, 512gb storage. Mine is obviously very snappy. Even in solidworks, it's very fast. I had a hp laptop before sp3 and even though the screen on the surface is smaller, 12 against 15.6 inch, I would not change back for a couple of reasons. Build quality is really nice, display is very nice (displaymate ranked it as the best they ever tested on any device), battery life is better also. Ms say that the battery life should last 8-9 hours but I don't get that. I get around 6 hours. Maybe because of the processor, mobility, it's so easy to carry around. I bought a sleeve case for MacBook air 11,6" and have my sp3, type cover and my pen inside it. About the charging time, don't know exactly but it's nothing that have bothered me. Thanks man. I think I'll settle for the i5 128Gb I just hope its snappy enough. I would go for the i5 8gb of ram. Its more future proof. It cost more, but its worth it. Was it necessary to add that last part to this article? Well, it's Alan F. after all. It's PA bro and they have to write this sort of crap. Moreover, they may not be getting any cut out of Surface as they get from other companies like Apple, Sammy etc. "Was it necessary to add that last part to this article?" I think it is necessary to point out the failings of the Surface as it represents complete, unbiased journalism. Only Microsoft fans think the Surface is some sort of uber-computer. Many others realize it is a "tweener" product that is neither a good tablet nor a good laptop. It's so deficient as a tablet that some users simply use the Surface as a tablet stand for their tablet of choice. Lol what would phonearena be without certain Google/Android fanboys bashing MS at every turn. So much hate. An eye for an eye, Liveitup. Alan F. is a known Apple fan. If you shut up on mentioning Google/Android fanboys I will also leave you alone but since you started it. You have given me artist license to express my view. Surface pro 3 is not without its flaw. Not mentioning the price there are serious overheating issue on their top end model naming the icore 7 model running day to day application. Its very heavy and intel new core M processor is on the way. So I will hold off my purchase till I need a laptop right away. I will save more down the road. I was not mentioning Alan F I was responding to your partner 0xFFFF or whatever his name is. A known Windows hater, Trolls don't buy products they bash . No product is perfect, no matter who makes them, Google, Microsoft or Apple etc however you guys only look for negatives in other platforms products that you don't use, swear you guys are allergic to positivity when it comes to MS.
How do you know i don't use. I not only use Microsoft product, i also design Microsoft solution for my users. I am not a fan of any particular platform but i have a strong dislike for fans that attack other platforms with bias opinions that why you get highlighted all the time. No you don't, what you're saying now dont match up with your history, Mr. negative. Which part i said about Microsoft is not factual? Only a fan like you refuse to face up to the fact. Anyway Microsoft fan are rare. Most consumers i met aren't fond of Microsoft. So being unbiased is important part of earning the trust of my client. I always let them know both the strength or weakness of each product and implementation. Again you miss the point, none of Googles products are perfect, none for MS and Apple even those widely praised could be improved so its not about what you its just the repetitive nature in which you always hate. You are the one that invest so much emotion into Microsoft and yet you do not depend on their product for survival. Such irony! The CNN reporters denied it and said it was nonsense but Alan F chose not to mention it. Instead of the $100 they should add atleast the type cover or even the touch over. Can you play any PC game on iOS and Android? Can you access any app and game that ever existed? Can you actually create apps and games for any platform? No? Then the Surface Pro 3 is infinitely better than those "toys". And if 1.5 pounds is heavy, I can give you the number to my gym girly man. I got news for you, you can't really play pc games on that machine for very long. My surface pro 2 would heat up like crazy even with simpler pc games. If you're looking for something of a full laptop experience but portable, might as well go for the MacBooks. You cant just say to someone "go for a macbook ". I'm an engineering student and macbook would be the worse choice for me becuase of the programs that are needed, drawing programs that we use in the university... It depends on what the needs are. But for some people, a macbook would be perfect.